The minimalist fad has seemed to fade into obscurity as quickly as it came sprinting into everyone’s running program. 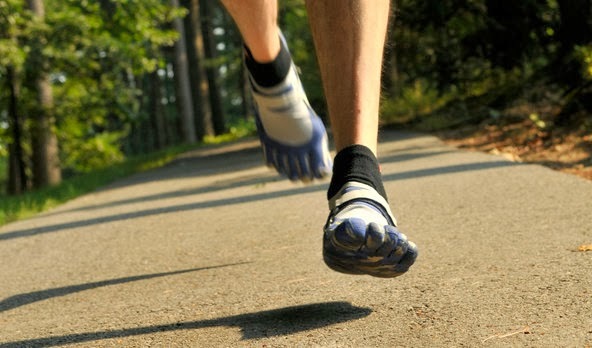 The days of seeing ‘Five Finger’ shoes on the streets both on runners and your everyday person have seemed to pass but does the minimalist/barefoot technique of running truly hold some merit. In an article in Men’s Health, “Barefoot Running Stumbles”, the writer presents the case well from both sides of the coin. The foot is an unbelievably complex part of the body consisting of 26 bones, 33 articulations, 111 ligaments, and 20 plus muscles in each foot1. If you think about the amount of motion and stability occurs over the thousands of steps taken in not only walking a mile but add the force associated with running it is truly impressive what our feet can do. 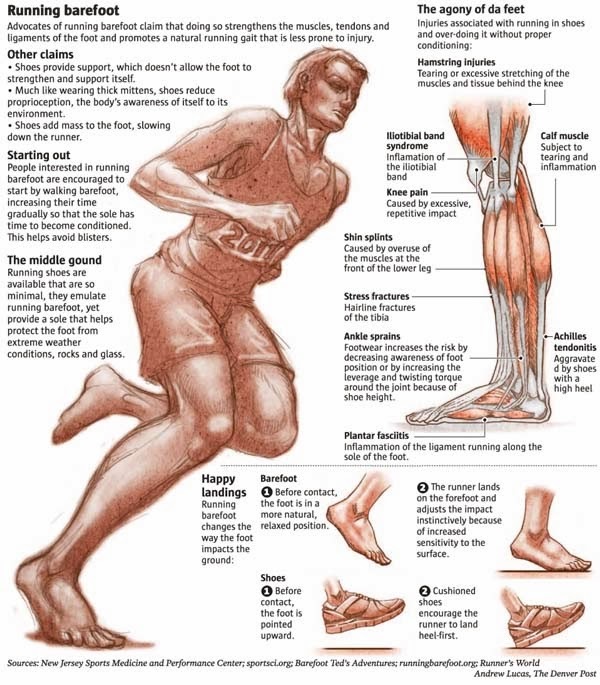 A study at the University of Wisconsin-La Crosse showed that a forefoot/midfoot landing in a less heel cushioned shoe increases the load per step by 11% and that can add up to over 7000 pounds of pressure added to the Achilles per mile. This is a significant amount of force and is typically where people new to minimalist running can get themselves in trouble and injured. Gradual progression in the key to regulating this this increase in tension and increase in pressure on the Achilles. The suggestion is that you start at adding minimalist shoes to only 10% of your mileage to start with and progress from there1. This is not a case of “if some is good, more is better”. While the chance for injury can increase when making the shift to minimalist or barefoot there are many advantages to changing to this type of shoe and adopting a forefoot or midfoot strike. One study looking at treatment options for exertional anterior compartment syndrome have found switching to a mid/forefoot strike can reduce and possibly eliminate the symptoms associated with the problem. For many athletes who suffer from compartment syndrome that could be the difference in their career. Many people on person accounts have felt a reduction in back pain due to the reduce heel when just walking around in a minimalist shoe. The effect on performance is also another area of interest and there has been no definitive literature stating what stride is best for optimal performance. Stanford University has actually adopted the idea of determining the stride type of their runners and then working to get the optimal amount of performance out of that stride rate instead of trying change someone’s natural stride pattern. The barefoot/minimalist craze has seemed to come and go but there is merit in working with this type of training. The key is to be smart about it and make sure to not go all or nothing. Please feel free to contact TAT with any questions regarding barefoot/minimalist running.